Let me introduce you to Chelsea. She is one super fit Mama however that wasn't the case growing up. She tells us how she got rid of the fast and packaged foods and now only eats whole foods that nourish her body. 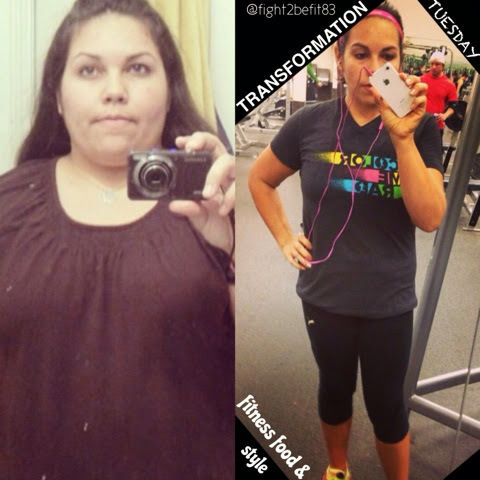 It's also been a gradual process as she started her new fitness journey 4 years ago. I am 30 years old. In the Summer of 2009, I made my first attempt to do something about my weight. I weighed 240lbs!! I joined a fitness group called Strollerfit (geared towards moms) and that was the first time I had exercised in 5 years. It kicked my behind!! I only did that for like a month. But later that summer I joined a gym, LA Fitness. But I didn't change my eating habits. So fast forward to Dec. 2009 and I just felt like, okay, I am going to do something. I am not going to expect fast results. A year feels long and fast at the same time, and if I can just look better than I do right now this time next year, I will be happy. I lost about 15 pounds. In around 3 months. The 15lb loss was enough to keep me motivated though. But I didn't set any goals. No weekly loss goals, no short or long term goals. Just-- Do better. I was eating SOO BADLY and SOOO MUCH that just eating smaller portions and less fast food in combination with going to the gym maybe 2-3 times a week carried me to a weight loss of 40lbs by August 2010. For the next year, I lost about another 15 pounds or so and when school started in 2011 I weighed about 185ish. Again, I had no goals for myself and didnt even really talk about my weight loss with anyone because at that time I didn't really want anyone rooting for me because that would make me feel like a failure if I didn't continue to progress. So then, in December 2012 I was in the middle of a marriage crisis and the stress and sadness gave me new motivation to push harder with my transformation. I had always said that I wanted to be able to run, to become a runner. So I bought a pair of 100 dollar fancy running shoes knowing I wouldn't quit if I spent so much money on those shoes. I downloaded a running app on my phone called Get Running and followed it at the gym and running outside. I signed up for the Rodeo 5k run to give myself a goal of finishing the app by that date. All of my goals thus far have been fitness related, not scale or clothing size. I pretty much got hooked on running after I finished the app on my phone and ran the Rodeo 5k. By the spring I was getting a lot more comments on my weight loss because I had reached a weight where if I lost a few more pounds, it was more noticeable. I started playing indoor soccer with some friends from a moms group I used to belong to at the beginning of April. It is an intense workout and super fun. That helped me see more results as well. I let myself coast through Fall 2012 and actually gained a little weight back for the first time. My clothes were getting a little tight Christmas time. When it was time for New Year's Resolutions, I decided to do the Advocare 24 day challenge to clean up my diet. I also committed to running a half marathon in February 2013. I knew I was at a stage where eating clean and avoiding processed foods was what would bring me more results. Doing so has become more habitual for me now. I'm by no means perfect, but I'm doing much better than before and having less episodes of bingeing to deal with my emotions. I went from nearly a size 22 to a size 8/10 depending on the brand or style and I feel much better about the way I look. I am healthier than I have ever been and I even ran the full Houston Marathon (26.2 miles!) January of this year. But the part of this whole journey that I'm proud of the most is that I am setting a good example for my children and living a healthy, active life in front of them. They know their mom eats healthy foods (and cooks it for them as well) and they know she loves to run, lift weights and play soccer. This is not something new for them to see from me, it's just my "normal" now and I hope to make such habits part of their normal life as well. I ate processed foods from cans and boxes. I also ate tons of sugar. I now eat about 90% whole clean foods and have seriously cut back on my sugar intake. I run and play indoor soccer. I like watching soccer and basketball. I was extremely unhappy with my physical appearance and very unhealthy. My children had yet to learn any of my bad habits so I knew it was time to change my life so I could set the example for them. They were only 5, 3, and 2 at that time. I hope to lower my body fat percentage and gain more muscle. I also aim beat my personal best 5k, 10k and half marathon times. *When I started I didn't follow any sort of restricted diet. I do badly with restriction. I ate whatever I wanted and if it happened to be something bad, I have learned to be satisfied with a very small portion of it. I don't drink diet soda. I love Coke and will never give it up. I just drink way way less of it. *If I eat something terrible for breakfast, I don't let it ruin my whole day. I used to just say, "screw it" and eat badly for the rest of the day. *I don't talk about my meal as being good or bad. I don't tell myself or anyone else that I at "so bad" or "so good" and rate my eating behavior. I just eat. *I stop eating as soon as I am full and have no problem with leaving food on my plate or even having to throw it away sometimes. *I don't weigh myself very often at all. Maybe once every two weeks or so. And I always give myself a high number I can accept and not feel bad if I see before I step on the scale. Sometimes I was right and I don't let myself feel bad, but most of the time the scale is less than what I expected.